This topic was published by DevynCJohnson and viewed 922 times since " October 03, 2015 @ 20:36UTC ". The last page revision was " October 04, 2015 @ 08:21EDT ". "getsid" is an open-source Linux command-line utility for obtaining the Session ID (SID) of a given Process ID (PID). This software is licensed under the GNU Lesser General Public License (LGPLv3 - http://www.gnu.org/licenses/lgpl-3.0.txt) and is made by Devyn Collier Johnson <DevynCJohnson@Gmail.com>. To compile getsid, open a terminal in the same directory as the source code. Then, execute gcc -O3 -pedantic -Wall -std=gnu11 ./getsid.c -o ./getsid or gcc ./getsid.c -o ./getsid. To install getsid, move the compiled binary to /usr/bin/ and then make it executable (using Root privileges) - cp ./getsid /usr/bin/getsid && chown root:root /usr/bin/getsid && chmod 755 /usr/bin/getsid. 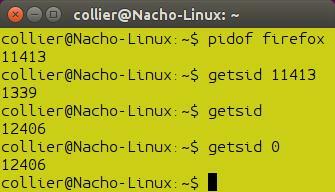 To use getsid, type the command and then specify a PID. The command will return the Session ID of the specified PID. If no PID is specified, then a PID of "0" is assumed.